Extreme Lost Kisses is Lost Kisses starring Rambo. One against a hundred the hundred don't stand a chance. The art is very very simple. Its almost just stick figures. There is violence. This savior battles henchmen and their leader. He saves the world from a nuclear bomb even. All the characters are no name brand ones. No one has any names. The story idea is great and the action to. Delightfully silly in both story and illustration, Extreme Lost Kisses #1 is the classic story of the professional day-saver, saving the day. Every page / panel evokes another cliche from the vast library of cliches attached to action films. About the time a reader begins to wonder what the payoff is going to be, or if there will even be a payoff, there it is. 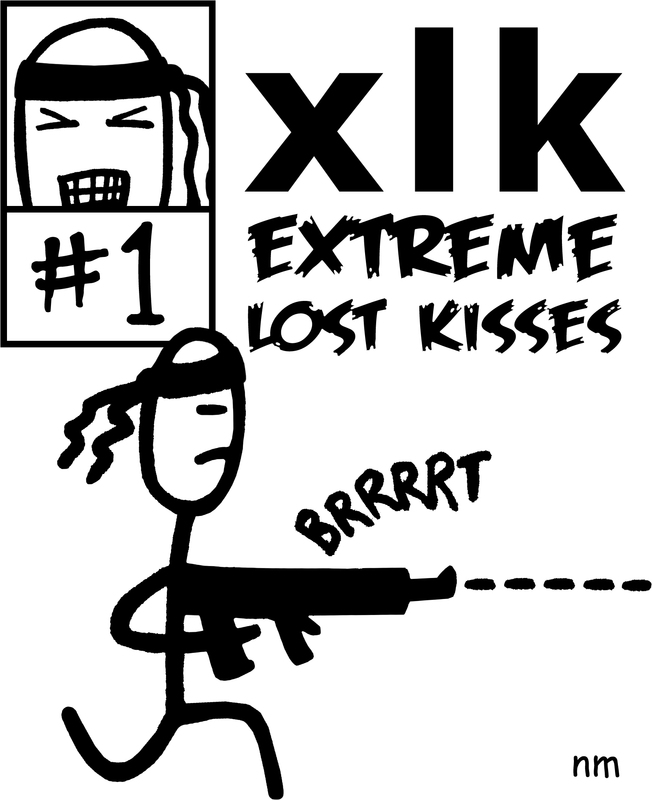 Extreme Lost Kisses is a good example of how XKCD has not yet cornered the market on stick figure comics. Although the deadpan narration carries much of the weight of the story, the illustrations deftly bring the story real expressiveness. It is a good reminder that not all stick figures are created equal. This strikes me more as a one-off than a series, but who knows what shenanigans a professional day-saver gets up to when he gets back from saving the day? I also doubted there would be a payoff in this issue, but there was. I guess I'll reserve judgment until Extreme Lost Kisses #2 shows up to save the day. Extreme Lost Kisses #1 You should check it out. What can I say, I’m having trouble putting this in words. It’s a simple concept, simple but great. I love how entertaining these mini-comics are. My favorite was Extreme Lost Kisses #1. You can actually check it out here CLICK! The story is about one single soldier, who possesses skills that even Rambo hasn’t even dreamed about. Hilarious. Again this is no Marvel or DC Comics. These are comics created by guys who like to tell stories & do it for fun. It doesn’t mean that they are not passionate about it, as a matter of fact, they are probably more passionate than some of the “mainstream” writers/artists out there. No joke. Brian John Mitchell has some great ideas & his writing is something we can all relate to. He wants to tell you a story & he does, it’s almost like you are either listening to him or you are so submerged in the comics, it’s crazy. That’s what I liked. Now Nick Marino’s art, simple, funny & cool. Yes, the mini-comics are black & white, yes they are stick figures, but you have to look beyond that. Again you do not need a complicated landscape of inks & colors to tell a story. Like one wise man once said: “Hater’s gonna hate.” I don’t. I liked it, & I am sure you will too. Obviously some people won’t & that is totally okay. Listen I didn’t used to like carrots, but one day my mom served them with lemon & salt, & now I cant stop eating them every day. I have super sight, yeah they are good for your sight, but that’s beside the point, I am getting sidetracked here.